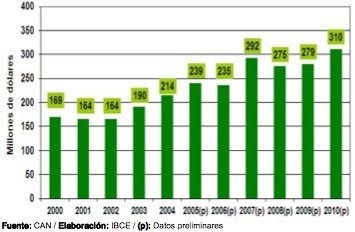 Tourism figures for 2011, welcome to Bolivia!! 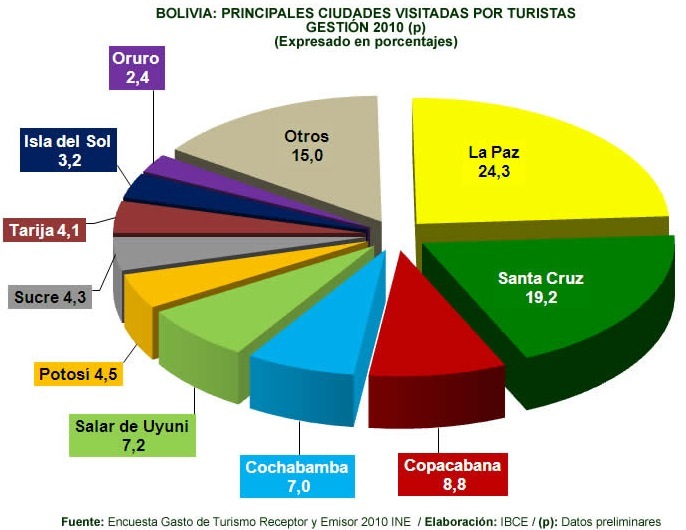 The USA and European countries are the ones with more tourists visiting Bolivia. 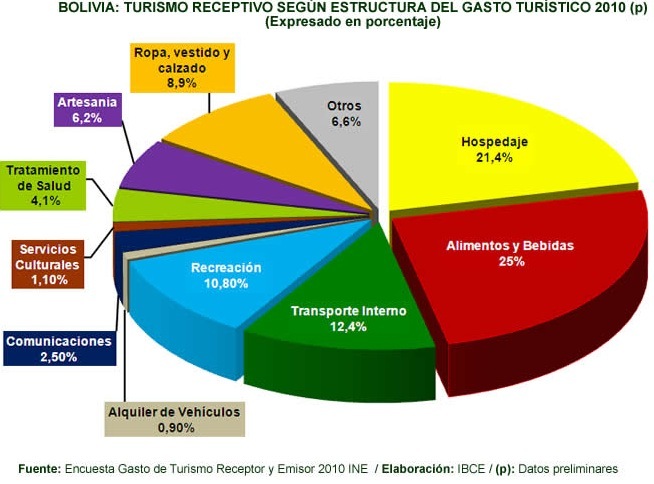 This chart is by type of expenditure, the four main components are: food and beverages accounts for 25%; lodging 21.4%; transport inside Bolivia is 12.4%; and recreation is 10.8%. These are areas that we can certainly improve, without major investment, quality service, cleanliness and attitude are keys for the WOMM (word of mouth marketing). With regard to clothing and crafts which are the next two in size, quality is the key for success. I remember many years ago there was a project called ADAM, which intended to set up quality standards, all main alpaca swatter producers who bragged about their quality, couldn’t deliver a dozen of say small cardigans, none of them were alike; either the arms were longer, the neck smaller… something that has changed over time. Plain vacation is the largest with 48.4%; visiting families and friends 27%; business 8.3%; work related 5.3% and then others. The first two are mainly the same purpose, the key would be to approach those Bolivians who have regularly received friends and relatives, see what they want, how and then supply what is needed, give discounts, promotions. If airlines have frequent travelers, in this case restaurants, museums, hotels and other amenities should be able to offer discount prices. As for the first one, we have to admit that most foreign tourism is the backpacker type: they do not consume much and ask of r rebates everywhere. And we need to slowly aim at the other type of tourism, one that demands more quality but is also willing to pay more. Bolivia receives the outflows of the Peruvian tourism, that is why so many come through Titicaca. The most crucial constrain we have to overcome are the blockades that happen anytime, and American and European tourist are so much afraid for. Who wouldn’t? 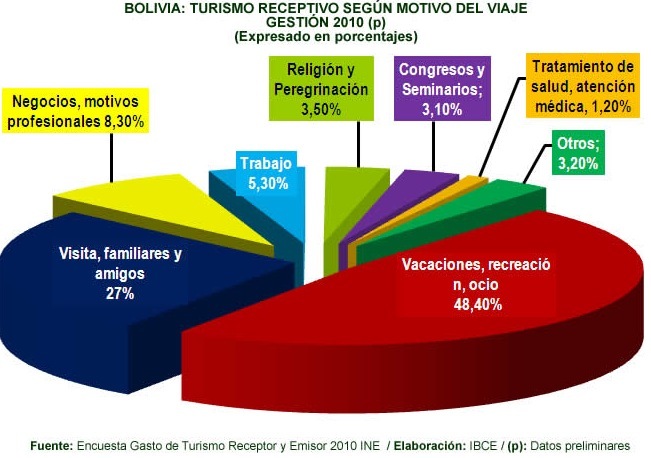 It is no joke to reschedule plane tickets, pay for seating preferences, accommodate flights with hotel reservations and with the time constraint for tourists to go back to work, so they can come next time… strikes and blockades are Bolivian tourism worst enemy. La Paz and Santa Cruz are the ones preferred, Potosi with 4.5% could certainly improve much more, as it is the city with the most beautiful colony architecture and the mint house, the churches, the Cerro Rico, it is incomprehensible that they receive so little, even less than Copacabana (about the name of Copacabana, if you don’t know the Copacabana beach in Rio de Janeiro, Brazil, has its name because a wealthy carioca woman went to visit the Madonna in Copacaba, by the Titicaca Lake, prayed, healed and when she went back, she named all that coast (her property) with the name Copacabana, in gratitude). Having so many beautiful and different things to show in Bolivia, we could assume most people end up in La Paz and Santa Cruz, because they are the more cosmopolitan cities of Bolivia? because the international airports are in those two cities? or because most of the embassies, consulates are in these two cities? who knows. But certainly this needs to change. Bolivia needs to offer packages, not only one trip to one city and then leave the country, we need to offer for example plays, theater in Santa Cruz; maybe concerts and museums in La Paz. Both cities need to be the hubs for the other cities to offer special events in specific times during the year. For example, the Baroque International Music Festival in the Chiquitania of Santa Cruz, has a life of its own, it could be tied to a major concert inside the Cerro Rico, where the top three groups go there and play; or take them to the Island of the Sun in Titicaca, there are plenty of opportunities. The key is that restaurants, hotels, other types of entertainment and also shopping be coordinated. And for that we do not need the government, not this one, nor had the tourism industry dependent upon previous governments. It has to be a private effort, that can guarantee quality. The government needs to make streets safe, put to jail those who block and that’s it, those two tasks are more than any government could handle. The end line is, Bolivian tourism is growing, despite all our problems, we just need to move one step further and go on, and then go on. Always forward!! This entry was posted in Bolivia, Business, Economics, Environment, La Paz, Potosi, Santa Cruz and tagged competitiveness, public safety, road blockades, strikes, tourism. Bookmark the permalink.